Travel India, A Compelling Insight To Goa And Other South Indian Destinations. For people who love to explore, India offers both a culture and landscape that is endlessly fascinating. Travel India Goa Guide covers the west coast of India starting at Terekol Fort, Goa's northern-most tip. We continue through the tea plantations of the Western Ghats and the backwaters of Kerala, to the southern tip of India, Kanyakumari; not forgetting the beaches along the way. We offer a unique and friendly guide for all travellers to India. With over 6 years of travelling experience in India we are able to share our learnings, favourite destinations, accommodation and travel tips that we have picked up along the way, both on and off the tourist routes. Who are we? We have travelled extensively throughout Goa, Kerala and the surrounding areas, and therefore this site focuses on those two destinations. Our last trip was on an Enfield Motorcycle, and you can read about it and find out about how to travel India by motorcycle in the Royal Enfield section. This section features essential tourist information such as visa information, a currency converter, how to find good travel insurance and India's climate. The getting around section deals with various ways to travel India, letting you in on what to expect when you board a train, hail a tuk tuk or brave the roads. There is also a section on flights to India, with great tips on how to find a cheap ticket, and a page that will help you find domestic flights in India. Our Goa guide covers all essentials about travel to Goa. Are you heading to the beaches in Goa? This site offers a unique guide to the beaches along Goa's coast from the quiet, remote expanse of Keri beach in the north to the lively tourist hotspot of Palolem beach in the south. All accounts are written with first hand experience - if we have not experienced it, we will not write about it, though we are keen to hear your views! Look out for additions to this site as we explore and review new destinations. The inland Goa attractions section of this site covers Goan attractions off the beach. Explore this section to read about Goa's forts, markets and villages. Discover the opulent heart of colonial Goa at the abandoned Portuguese capital of Old Goa, or the almalgamation of cultures in Goa's vibrant, modern-day capital of Panaji. When we travel India we usually base ourselves in Goa, so you will get recommendations for places it took us months to find. Don't miss our collection of Goa pictures - some of our favourite photos of Goa taken while on our travels! The Kerala overview gives a background into the south Indian state of Kerala, its history, unique cuisine and fascinating culture. There are some Malayalam phrases (Kerala's official language) and information on festivals in the region. We have included guides to the major cities of Thiruvananthapuram (Trivadrum) and Kochi (Cochin). 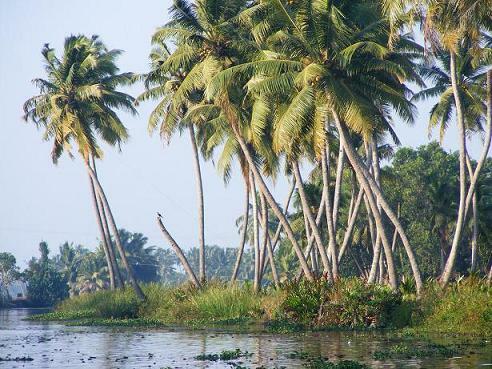 There is also an interactive map of Kerala and some pictures to inspire you! The pages about Kerala travel are divided into sections that cover Kerala's famous backwater regions, with information about boat cruises, backwater destinations and houseboats. We explore in 'Kerala's beaches' the popular resort of Kovalam, laid back Varkala and the lesser known beaches of north Kerala. Our section on hill-stations provides useful tips on travlling to these beautiful mountain regions, and the wildlife reserve pages cover the many areas in Kerala where it is possible to see wild elephants, and perhaps even a tiger. For a picture of India as a whole, this part covers some facts about India such as population, weather, festivals, religion - as well as a map and gallery. The information in the travel sections of this site is first-hand, and because we have spend a lot of time on the road travelling independently in India, our tips and recommendations will hopefully be valuable and provide a personal insight that other sites may not. We really hope you enjoy browsing and we are sure you will find advice throughout the site that we have only ever found on the road.